I’ve been looking to join a knit and natter group for a while and I came across the Make Do and Mend shop in Chelmsford that run a couple of weekly groups. I mentioned to Hannah, who runs the group, that I’m really interested in chunky knitting and she handed me a pair of 28mm knitting needles, that had been customised from a broom handle, some cut fabric and wool. This was a quick test piece that I made. 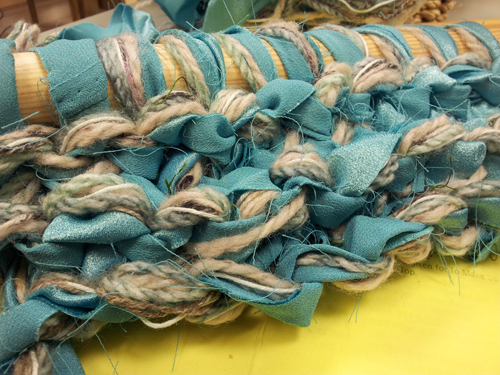 The needles were surprisingly light-weighted and although the piece knitted up really quickly it was a slow process. More practice and experimenting to come!